WebOptimum is known to be an advertising-supported application. The main aim of this infection is to spread all kinds of advertisements, so there is no doubt that you will see them on the websites opened with Internet Explorer, Google Chrome, and Mozilla Firefox. Ads themselves are not only very annoying, but they might also put your system into danger. Therefore, it would be best that you eliminate WebOptimum from your system as soon as you can. 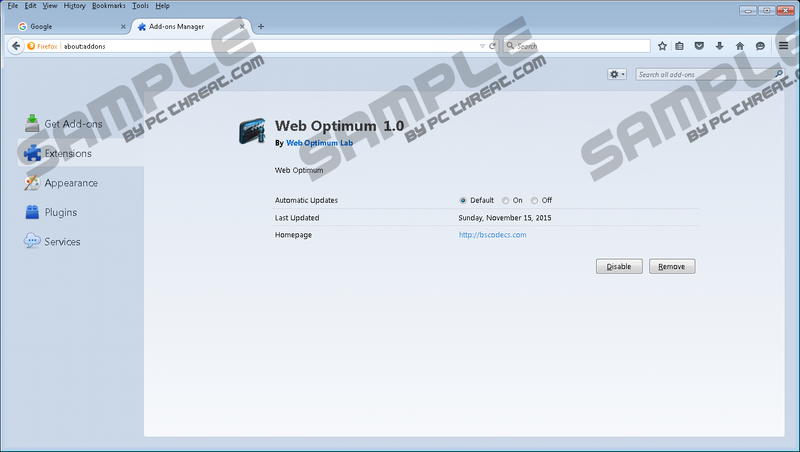 There is an uninstall of WebOptimum in Control Panel; however, it will not be enough to erase it via Control Panel if you use Google Chrome browser. More information on the removal of this adware will be provided in the remaining paragraphs of this article. WebOptimum has been developed to show various commercial advertisements on a user’s screen. As we have managed to find out, you will see pop-ups that will cover your entire screen. Of course, you might see other kinds of ads too. They will keep appearing on your screen unless you delete WebOptimum from the system. Be sure that you do not click on any of the ads provided by this advertising-supported application. It is not advisable to do that because you might be taken to other web pages and thus infect your system with malicious software. This might happen really quickly because you will never know which of the ads are untrustworthy. Furthermore, researchers at pcthreat.com say that WebOptimum might also be interested in the web pages you visit, your search queries, your IP address, and other important details. It uses them to show relevant advertisements for you. Do you want to keep information about what you do on the web safe? If so, delete WebOptimum right now. This will help you to protect your system and not to experience any privacy-related issues. It has been also noticed that WebOptimum changes the Target line of Google Chrome browser. Our researchers say that it loads its extension like that. Unfortunately, the changes will not be restored if you erase this adware via Control Panel only. Actually, there is a really huge possibility that you will not only have to delete WebOptimum, but will also need to detect and eliminate other infections because this threat travels together with them. You might find it really difficult to detect them, so we suggest that you use an automatic malware remover for this matter. It must be reliable, of course. WebOptimum itself can be removed via Control Panel; however, you will also have to fix the Target line in order to erase this adware fully. You will find the instructions that will help you with that below, and you are welcome to use them. If you have never tried erasing any program from your PC, we suggest that you use an automatic malware remover. We are sure that SpyHunter will erase WebOptimum adware for you in the blink of an eye. It will also take care of other suspicious programs that are installed on your PC and act behind your back. Right-click on the icon of your Google Chrome. Quick & tested solution for WebOptimum removal.